QUEENS — Despite being involved in politics in some fashion for most of his life, Jose Peralta has only lost one election: a student government election at Flushing High School. Peralta likes to point out that he only lost by 13 votes. "The number of the district that I represent now," Peralta laughed. Peralta also likes to call the 13th State Senate District — covering Jackson Heights, East Elmhurst and Corona — a veritable "United Nations" because of its diversity. And representing that diversity in both the Assembly and the Senate, Peralta said, makes him the ideal candidate among a crowded Queens Borough President race that includes former Councilwoman Melinda Katz, councilmen Leroy Comrie and Peter Vallone Jr., State Sen. Tony Avella and Barry Grodenchik, a former state assemblyman and longtime Borough Hall staffer. "When you have a borough so diverse, and you have someone who has the experience representing a diverse district, it becomes almost like a natural fit," Peralta said. "It's reflective, and a microcosm, of what Queens is." And now he wants to help make the borough a destination for other families and businesses in his borough president run, shedding the "outer borough" moniker. 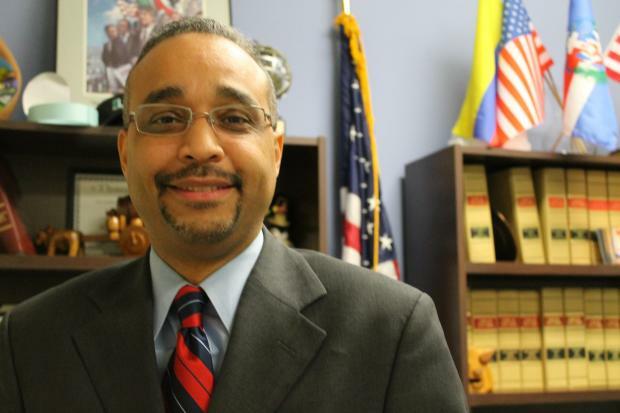 Born in Washington Heights in 1971 to Dominican immigrants, Peralta and his family moved to Corona when he was 6 as a way to give his family a better life and a better education. "My parents wanted us to get the best education possible, and they wanted to create an environment so that we could move forward and live the American dream," Peralta said. "As an immigrant, you come here and that's what you want to do." Peralta attended P.S. 14 and I.S. 61 in Corona before heading to Flushing High School, where he played the saxophone, was a third baseman and gained an interest in politics— despite his one political "loss." After graduating, Peralta moved on to Queens College, where he studied psychology with a minor in sociology, and took political science courses. He again ran for student government, winning a senate seat, then becoming the school's first Latino student government vice president, and after that, the first Latino student body president. While in college Peralta was active in Community Board 3, where he was one of the youngest members. After graduating he went on to work in the State Assembly, where he dealt with constituent services, then moved on to the NYC Central Labor Council, where he worked as an advocate for workers' rights. In 2002, after redistricting created a more diverse 39th Assembly District, Peralta decided to run for the seat. He was elected to the State Assembly, narrowly beating out then-District Leader Francisco Moya by 270 votes, before going on to win 74 percent of the vote against his Republican challenger Charles Gonzalez. In the runup to the 2010 special election to replace state Sen. Hiram Monserrate, who was found guilty of misdemeanor assault charges against his girlfriend and expelled from the senate, Peralta faced media scrutiny when a Daily News report alleged that he directed taxpayer money to an inactive nonprofit, something Peralta has strongly denied and which was ultimately never proven. Sen. Charles Schumer and Queens Congressman Joe Crowley were also connected to the nonprofit, though neither was included in the report. Peralta won again in 2012, and soon set his sights on Queens borough president. "Why not build on my track record, build on my relationships that I have?" Peralta said. Peralta has raised a little more than $134,000 for his run, and last month received the endorsement of another borough president, Ruben Diaz Jr. of the Bronx, according to reports. One of the most important things on his agenda, Peralta said, is to erase the idea of Queens as just an "outer borough," a description he calls a "slap in the face." "Queens has it all," Peralta said. "We have the airports, we have the park land, we have the great schools, we have the great restaurants, we have the diversity. We have everything that's needed for this borough not to be an outer borough." "Queens is a place that's a destination," Peralta added. To do that he wants to add new small businesses to the borough, build new affordable housing— and of course, rebuild the areas that were hit hardest by Hurricane Sandy. It's that last piece of building that Peralta says is at the top of his agenda. Since the storm, Peralta has donated both time and resources to the clean-up effort, going to town hall meetings and listening to residents' concerns. But he acknowledges that there's a lot more work to be done to fix what Sandy destroyed. "It's nice to show up right after the tragedy and say, 'We're with you,'" Peralta said. "But people need to have consistency." Another issue that's sure to become more high-profile as time goes on is a series of proposed developments in Flushing Meadows-Corona Park. Peralta has already come out in favor of one of the projects, a proposed Major League Soccer stadium, contingent on the promise that the league would replace all of the park land it would take up as part of the development. Other plans — such as a United States Tennis Association expansion and the development of a mall owned by the Wilpons — Peralta is not as sold on. The mall, Peralta said, doesn't deal with many of the concerns faced by the surrounding area— namely, affordable housing. As for the USTA expansion, Peralta said that like MLS, they'll need to replace even the little park land they would use— something they've yet to promise. "Every inch of park land has to be replaced," Peralta said. "I used to go to Flushing Meadows park and play there, for many summers, and even during the winters. Flushing Meadows park was our backyard." On education, Peralta said he's focused on school crowding, but also wants to make sure parents have more of a choice of quality education, whether it's public school or charter schools. Peralta also sees Queens as a middle class borough. To that end, he said he'd help focus on economic development and attracting small businesses to Queens. "If you bring the jobs, than you bring the workers," Peralta said. "They'll be able to pay rent, be able to raise a family, afford health care, pay their taxes, and then it's kind of like a cycle." Throughout Peralta's 35 years in Queens, he's seen the borough change— mostly for the better, he said. Now, Peralta said, he wants to help continue that improvement. "My job as borough president is to make sure it becomes better than it is today," Peralta said. "I think I'm the person who's qualified for that."